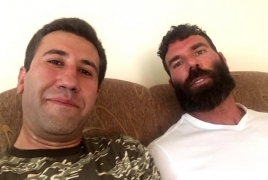 PanARMENIAN.Net - Famous American gambler Dan Bilzerian is currently in Artsakh (Nagorno Karabakh), the country’s human rights defender Ruben Melikyan revealed on Tuesday, August 28. Bilzerian registered with the Armed Forces of Armenia after receiving an Armenian passport, the Military Commissariat said on Monday. According to a representative from the Commissariat, Bilzerian submitted all the necessary document. Earlier on Monday, Dan and his brother Adam received Armenian passports in Yerevan. Bilzerian revealed in a tweet on Sunday that he will arrive in Yerevan and head to Thailand afterwards.